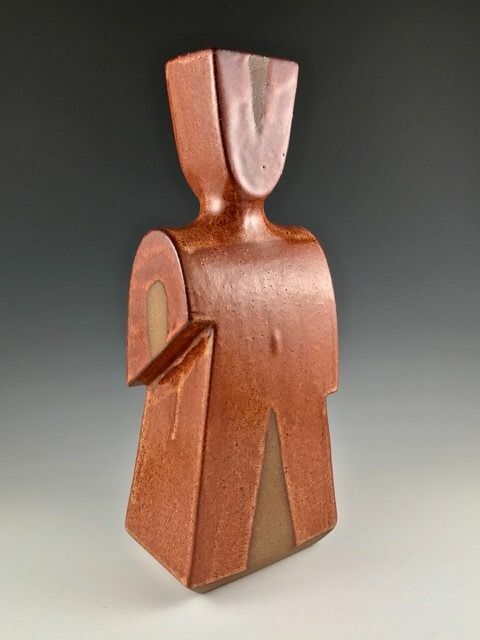 Curated Ceramics visited ceramic artist Peder Hegland at his Sartell, Minnesota home and studio in February 2018. We began carrying his work last year. Now planning an update to his Curated store for March 2018, it was a good time to learn more about his career and ceramic art. He’s been one of our favorite regional makers for years. 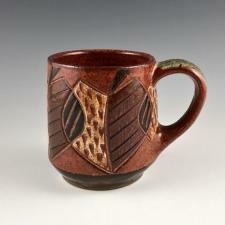 His carefully executed functional stoneware and bold illustrations are a striking draw at Midwest art fairs. 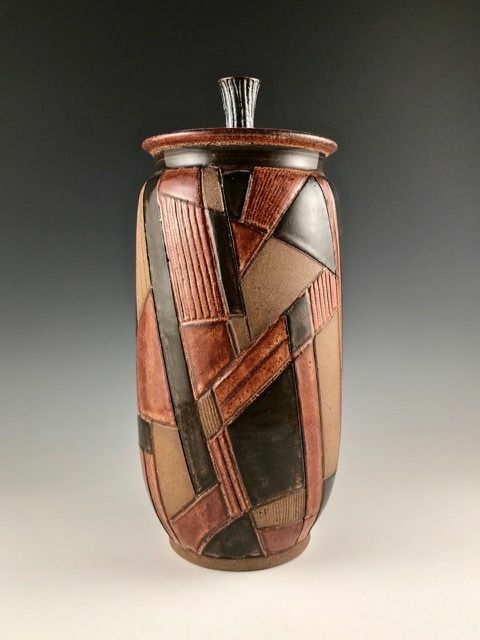 Our discussion began with his youth in Wisconsin, then getting his degree in Chemistry at Luther College (Iowa), and finally his conversion to ceramic artist after returning to Luther (under Dean Schwarz) and California summers at Pond Farm (under Marguerite Wildenhain). For sake of brevity, Curated has decided to first release his thoughts on Inspiration. Soon to follow we’ll release his rich biography titled Paths Taken. Thank you, Peder, for generously sharing your story with us. 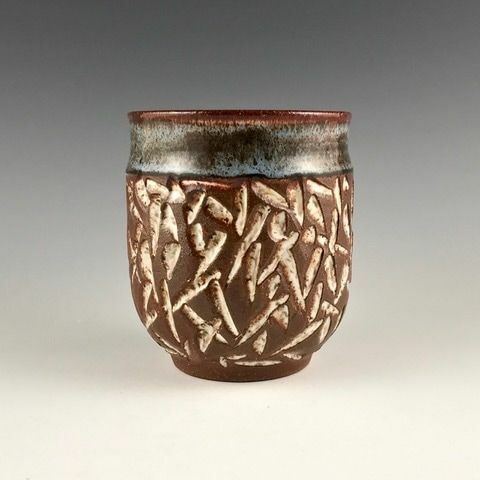 Steve Basile Partner, Curated Ceramics Part I- Inspiration Steve Basile, Curated Ceramics: At what point in your career did you begin to see your voice emerge in the work? Peder Hegland: It’s a gradual thing. At the start you’re very influenced by teachers and what you can do. The whole point is just to develop. It kind of happens organically if you just keep working, trying new things, failing at things, and seeing what sells and what doesn’t. Just do according to who you are, what you like, and what you’re successful at. A style begins to develop. You can see that with anyone who’s been doing it a long time. It depends on what kind of person they are. That’s why you have such an amazing diversity in ceramics. Especially with people who’ve been doing it for a while. They make pots according to who they are. Curated: When I look at your work, you’ve held steadfast to Marguerite Wildenhain’s teaching about craft at Pond Farm. You haven’t fallen far from that tree in training. I feel this is to your credit. Instead of chasing around a bunch of Marguerite’s pots from decades past, and thousands of dollars, I can get work from Marguerite’s school with your creative illustrations added. You have rural and wildlife themes in your work. Does that come from your upbringing and time here in rural Sartell, Minnesota? Hegland: I grew up in Racine, Wisconsin near Milwaukee. It’s an industrial town on Lake Michigan. But my family always vacationed in northern Wisconsin. We spent a lot of time in the north woods. That’s where it probably started. Also, at Luther College, the countryside is just incredibly gorgeous. It was another big revelation to me. I spent a lot of time outside fishing and exploring around. At that point I decided that’s really the kind of place I wanted to live. When I worked for Deneen Pottery, I lived in the big city (St Paul, MN). That was interesting too. But after that I wanted to live in a small town, the country, and north woods. When you’re in that atmosphere there’s nature all around. Curated: So, your work reflects fondness for the rural nature experience applied to the craft that Marguerite ingrained. Hegland: Yes. At Pond Farm if you were a beginner she had a very rigid method for teaching you the beginning techniques. The steps. But after that the emphasis was on creativity. She harped that she did not want you to copy her. So, in a way, that my pots aren’t that far from hers may not be something she would have liked. That said, I make what I value and like. It just happens I still use some of the same techniques. Curated: I may have an overly simplistic appreciation, but feel it’s to your strength that you have carried Marguerite’s craft forward. I like the connectedness to Marguerite that comes from owning your work. There’s something reassuring about the craft of a legend and also seeing your voice as an artist. You grew up in Racine, but there was something about the woods around Decorah. The land, the animals, the trees, and all that. People talk about Pond Farm the same way. About wandering the areas around the pottery where you can go in the woods to draw inspiration then return and sketch it on the pots. Hegland: Pond Farm was another very beautiful place. Nature was a very important part of the curriculum. At Pond Farm every Wednesday afternoon was drawing. Marguerite thought drawing was a very important tool for a potter. Depending on what your ability was, she would give you a problem and challenge you. People who had been there several years, who were more advanced, would ask if they could just draw. Period. So you could spend the whole summer drawing. And often she would send you up the hill to find something to draw. The point was to learn and see form. Curated: When seeing drawings on your pots, would you say the illustrations capture rural Minnesota, Decorah, or even Pond Farm? Hegland: All of it, I would say. Everything is in there. An idea can come from any place. There is unlimited inspiration in nature if you take the time to look. Curated: I feel lucky to have regularly connected with you here in Minnesota. I look at your work and think of both you and Marguerite. Hegland: I’m proud to have had the opportunity to study with Marguerite but also feel my work should be judged and appreciated from where it is now, many years later. ©Curated Ceramics 2018. Text and images may not be reused without expressed permission from this website. 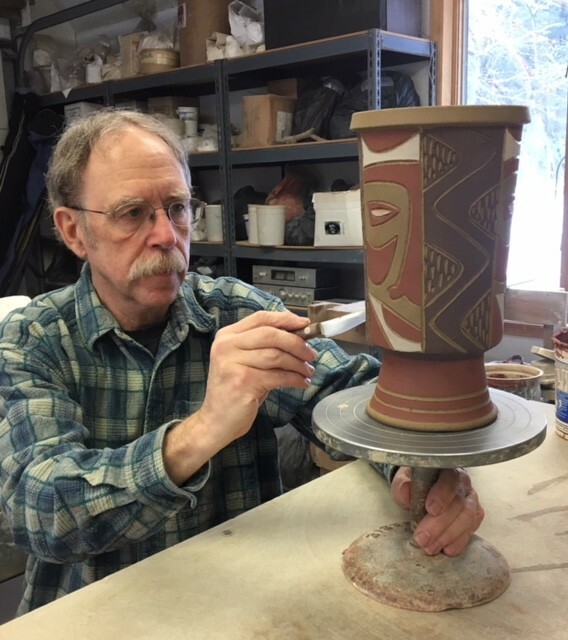 Curated Ceramics visited ceramic artist Peder Hegland at his Sartell, Minnesota home and studio on Feb 6, 2018. 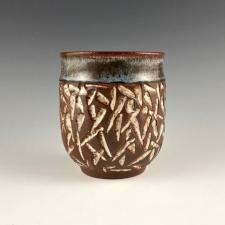 Part II- Paths Taken Steve Basile, Curated Ceramics: You have a good bio on our website. It gets to the heart of your story. Something we talked about early on is we were both chemistry undergrads in college. Then you took a liking to ceramics. Could you tell me about how you went to college for one discipline and came out with another? Peder Hegland: It seems like in my schooling I ended up going on this science track. Every time I had tests I did well in science. I was interested in it also. It just seemed like the path that I would take although I wasn’t specifically interested in chemistry. So, when I went to Luther College, chemistry seemed to be the thing that made the most sense. Curated: So, chemistry seemed like a field that would fit you? Hegland: I thought so. I was starting to realize by my senior year that perhaps it wasn’t the right thing for me. Curated: Were you losing interest in the studies or were career options not particularly compelling? Hegland: It was kind of both. The career thing was important because I was looking at what I could do with it. Where it was likely to go. It was probably in a factory developing some product. Curated: So, you saw lab work in your future with the chemistry undergrad degree? Hegland: I realized that I probably wasn’t good enough to be a crack research scientist. Like some people who get to work on really interesting things. So, I would instead be working for Palmolive or someplace like that. It just didn’t seem like what I wanted to do. Plus, you have to remember what the times were like. I graduated in 1972 and there was all kinds of upheaval in society and different ways of looking at things. So, when I was a senior in college I had this roommate, Michael Devenish, who was an art major. I was doing all this lab stuff and he’d come back to our room with all these great art projects. It was really intriguing. My roommate became an assistant to ceramics professor Dean Schwarz. Then Dean went to Korea on a Fulbright scholarship. So, Luther College paid my roommate Mike to teach Dean’s ceramics class. I needed an art credit as a requirement. So, I thought, “My roommate’s teaching the class? I’m going to take this.” It only took about a week and I was totally mesmerized. I did a semester with Mike and one with Dean. Then I graduated. Curated: So, you had just two semesters of clay? Hegland: I did my whole educational career and had just one art class. I was always on a science track but then this whole new world opened up. Possibilities that I had never really considered. I found it very exciting, but still wasn’t convinced to turn around 180 degrees to do it. I finished my chemistry degree, went home, and worked in a lab in Milwaukee. Curated: You ended up with that lab job. (laughs) Hegland: Then Dr. Kelso, a biochemistry professor at Luther, called, “He had be awarded grant from the Army to do research. He needed a lab assistant. Was I interested?” I was at home and working in this job in Milwaukee I didn’t like. I thought, “Sure. I’ll go back to Luther.” So I did. The work was at Luther in the biochemistry lab in a little corner doing research. I got paid actually quite well. I was also back in Decorah (IA), which I loved. It was a completely different experience. I was no longer a student but a employee of the College. One of my fringe benefits was I could take a free class. So I took two more years of pottery. At that time at Luther the pottery class was in the old art barn. Dean Schwarz had made the entire pottery studio from scratch out of virtually nothing. He turned it into this mini Pond Farm situation. The art barn was the most exciting place on campus. It was an old building that the art department had taken over. With almost no budget, Dean and Mr. Running, the painting instructor, build 25 or so Pond Farm-style kick wheels. They were beautifully made. I now have one in my studio. It’s 50 years old and still works perfectly. Curated: I cannot connect why 25 people would be in Decorah using kick wheels in a barn. Was Dean a magnet for ceramics at that time? Hegland: Yes. His class was always full. It was one of the most popular classes on campus. He created the entire pottery curriculum based on the Pond Farm model. Curated: Does the barn still exists? Hegland: It does. I wasn’t an actual barn but a old building. Now they have turned it into offices. Around 15 years ago Luther built a new art building. They sold all Dean’s old wheels. That’s when I got mine. They moved the art department into this brand new typical sterile art building you see everywhere. They bought all new electric wheels. So all that has changed. Curated: So were all the old Luther students picking up the kick wheels? Hegland: A lot of people who had used them as students. I bought one. Peter Deneen bought some. He still has his. Curated: Was Marguerite Wildenhain’s Pond Farm going at the time Dean built out the barn? Hegland: Dean had met Marguerite in the 1960s. He was in the Navy and used his free time to visit artists like Hamada in Japan and Marguerite in California but hadn’t studied with her. He was an art major in college, graduated with an MFA, then went into the Navy. After he got the job at Luther he started studying with her at her summer school at Pond Farm. Curated: Let’s go back to being a student at Luther. How did you come to transition from science to art in your early twenties? Some people switch tracks 10 or 20 years after college. Had you just lacked art exposure before college? Hegland: I only had one art class in middle school. I did well but there was nothing that said this was a career or a lifetime choice that I could actually do. I didn’t know anybody who did that. So my change was part disillusioned with science, part being excited about a new thing, and part about the times. The crafts were experiencing a boom in interest and that was something seen as a cool thing to do. All those things were important in getting me started. 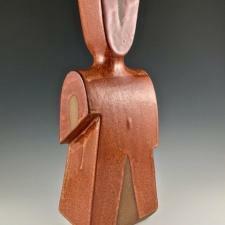 Curated: Was craft in that era a natural offshoot of the hippie movement? Hegland: Oh yeah, absolutely. Go back and look at the 1960’s Whole Earth catalog. It was all about how to get involved in crafts, going back to the country, and handwork. Then 10-15 years later the 1980’s Whole Earth catalog was all about computers. So, crafts are what had happened in those years. 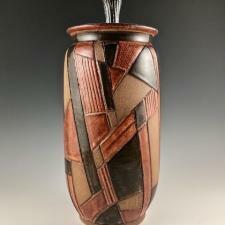 Curated: In every potter’s expression is a healthy mix of both art and craft. What part caught your attention? Handcraft or artistic expression? A craft career or an art career? Hegland: I was first intrigued watching someone throw. The skill that was involved. This is a common thing. You think, “Wow, I would really like learn how to do that.” Dean brought Marguerite’s techniques and philosophies to Luther College and worked them into a college program. This was different than Pond Farm where you made pottery eight hours a day. In Marguerite’s method, you learn technique first because you can’t do anything until you have basic skills. Once you get beyond that, it becomes all about aesthetics. What’s a good shape? What elements of the shape go together to make an exciting form? How do you express your idea by accentuating this or that? So craft then art. Art is really the exciting part. I enjoy the craft very much but it’s really the aesthetics that is interesting and exciting. Curated: You went back to Luther and took two years of clay classes. What was your next step? Hegland: There’s a couple factors. First, at Luther I met my wife. After that our moves were based on both of our careers. After two more years of clay studies I decided wanted to be a potter as a career. My wife was moving to Minneapolis for medical school. I knew wasn’t ready to go out on my own as a studio potter yet. I had heard that Peter Deneen (St Paul, MN) was looking to hire potters I’d never met him. Just knew who he was because he was also a Luther College guy. Both Peter and John Coiner, another Luther guy, had big production shops in the Twin Cities. I wrote a letter to each. The response from John Coiner was, “Yes, I’m looking for helpers. I can hire you. You’ll start as a shop assistant doing menial jobs and I’ll pay you a stipend of $100 a week.” I got a letter back from Peter Deneen, “Yes, I’m looking to hire people. You can start immediately throwing pots and my potters can make $300 a week.” The situation with Peter was but was an absolutely great one for me. Just what I needed. I made pretty good money there and worked really hard.I got to develop my skills and to be in the Twin Cities with my wife. Curated: When you were at Deneen Pottery, were you doing production work or more creative? Hegland: The Deneen shop in those days made a complete line of everything. We made too many things, actually. At that time Deneen Pottery had a store in Park Square Court. When Butler Square first opened, they also had a huge store there. Plus, we did wholesale. There was also a store in Rochester we used to supply. We made everything from spice jars, goblets, tea pots, canister sets, dinnerware sets. We made mixing bowl sets. We made big fancy vases. Peter was a very ambitious and talented guy. 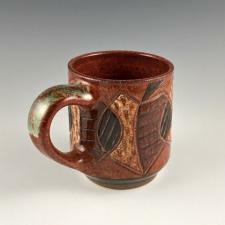 Curated: Was Deneen Pottery a production atmosphere or was license given to the employees to do more creative things? Who was the creative director? Hegland: Peter was the main director of everything. Peter would give you a shape to make like teapots or canister sets and tell you how many were needed. You were paid by the piece. You had a little bit of freedom after you finished production work to make stuff on your own that could be sold through the shop. More creative pieces. Curated: Would either production or free time creative have come out with your name on it? Hegland: Yes, I had a stamp. We had the shop stamp and our own stamp. Curated: So, you did have some creative expression there? Hegland: Yes. Mostly through my Pond Farm experience in the summers. The first year I was there, 1976, Peter had already been to Pond Farm several times. There were maybe eight people working at the Deneen Pottery throwing pots. Peter wrote Marguerite Wildenhain and asked if he could bring us all out for her summer school to see if doing a group learning thing would work. Curated: If Peter already had a going concern with the pottery, what was he hoping to gain from sending you guys? Craft wise, art wise, both? Hegland: I think he thought it would just make us all better. Everything. Make us better potters. Curated: Had you been to Pond Farm by then? Hegland: I had not. I had met Marguerite because she’d given a couple seminars at Luther. At that time, it was really hard to get into Pond Farm. There were only about 25 students allowed in the summer school.. Marguerite was this world-famous potter. She got hundreds of requests every year. I got in the first time through Peter. Otherwise I may have never gotten in. Then once she saw I was really serious she let me come back on my own. Curated: You went back on your own still while you were working at Deneen Pottery? Hegland: Yes, Peter let us do that. It was incredible. Pond Farm had six-week summer classes. I went five years in a row. Marguerite’s last five from 1976 to 1980 I went to California for a couple of months. Curated: It’s amazing that you were studying under Marguerite. Talk about good fortune. You hit the lottery on that. Hegland: Many, many points along this path I’ve just been so fortunate. I’ve had a lot of unbelievably good luck. After my time at Deneen Pottery ended my wife graduated from medical school and did her residency in Iowa City. That’s when I had to go out on my own as a studio potter for the first time. Curated: Did that mean setting up tables at craft fairs? Which is not a lot different than what you do now. Hegland: That’s right. There are all kinds of different paths. The path I took was art fairs all over the Midwest. I also tried several galleries. David and Jean Aurelius had this gallery in Door County, Wisconsin. In the mid-1980s I started selling my work there. My experience with them has been so much better than any other gallery experiences. So, after a while I just gave up on all other galleries. I haven’t really dealt with any galleries except for them because their business is so good. They’re completely honest and we’re friends. It’s all positive. The problem with galleries is they only show a small amount of your work and then they want to dictate what that is. Many times they can have financial problems and you don’t get paid. Generally, they’re good people trying to try to do a good thing, but it’s just very hard to do. 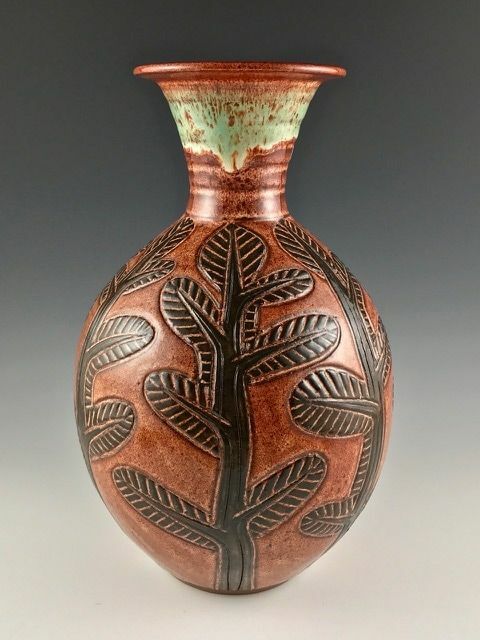 Curated: Was your disposition at Luther or Pond Farm unique in appreciating rural America or were some people city folk thinking, “Hey, I’m getting mosquito bites!” Hegland: At Luther the people who took pottery could be anybody because it was a class. They might start out as someone like me who needed an art elective, or didn’t know what they were getting into, or didn’t even want to be there. But at Pond Farm almost everybody was there because they really wanted to be there. Over Marguerite’s career, especially at the beginning, she had to fight a lot of battles with people who didn’t want to be serious. Some even thought they knew pottery better than she did. But by the time I studied with her, toward the end of the Pond Farm period, it was mostly people who had been there before. People who knew exactly what they’re getting into. One of the great things about Pond Farm was it’s mostly a group of people who were totally into what was going on. There was no wasted psychic energy. You got there at eight in the morning and you dived in until three in the afternoon, by which time you were exhausted. It was like heaven for someone who was into it. There were all kinds of different people with all kinds of interests at Pond Farm. In 2000 there was a show called Ripples: Marguerite Wildenhain and Her Pond Farm Students. If you look at that catalog, there are students who veered off into abstract metal sculpture and all kinds of different artistic paths. This goes back to Marguerite’s main thing of giving basic skills as a potter, then challenging you to develop as much as you could the rest of your life. Wherever that would take you. You didn’t have to be a potter. She was always saying there’s too many potters. In her perfect world, only the people who were totally dedicated would continue on. Curated: If Marguerite were to have followed the careers of the hundreds of people that spent time with her at Pond Farm, who might she have felt adhered most carefully and successfully to the summer teachings within and outside of clay. Hegland: The easy answer is David Stewart. Though I think that’s an impossible question because there are so many artists. Curated: When you think of your five summers at Pond Farm, were there moments where you had one-on-one time that was very personal and influential? That’s carried forward these 37 years into your career? Hegland: Sure. That was her teaching method. She would go around to every person and examine what you’re doing and give critiques. That was the teaching method at Pond Farm. She and David Stewart (her studio assistant) were different but complimentary people. In fact, sometimes David might tell you one thing and then Marguerite would come by and tell you the exact opposite. As she would make her circuit, you would listen very carefully to what she was saying to the next person. Sometimes you’d follow her into the next room and she’d tell you to go back. She was such a Master by the time I studied with her. She was in her eighties. She had a whole lifetime of experience and wisdom. You wanted to get every morsel you could. During the day there was personal interaction with her. She would give you some encouragement and you’d be very happy. Other times she would honestly tell you what wasn’t good. So you’d be despondent and thinking about what you could do to make it better. She was European and reserved. She’d sometimes invite people down to her house for an after-school glass of sherry or something. She lived in a little house that she built herself. A small little house, but every inch of it was just exquisite. There were Gerhard Marcks sculptures in the window. A collection of shells and rocks. She had this beautiful garden. She was an avid gardener which was done for form and beauty like everything she did. That was a very special thing. I had some encounters with her in the teaching process. I remember one time she had come to Luther for a seminar when I was a more advanced student. I was working in a little room by myself. She came in and was watching what I was doing. She looked at me for a while. I think had a beard then and she said, “these young people, they don’t have any character yet in their faces.” She was looking at me and I’m just thinking, “Yeah, I’m just this young guy who doesn’t know anything.” My face is no longer young. Maybe I’ve earned some character now. She was really spare with compliments. One time she told me ” you are not without talent”. That was the highest compliment she ever gave me. I took it to mean, “maybe I have a little talent.” Curated: She was spare with her compliments, but did you understand she was inherently on your side or looking out for your good and development? Hegland: Yes, totally. The whole point was the development of the student. Pond Farm was her school. It wasn’t funded by anybody else. She ran it exactly the way she wanted. If she didn’t like you or decided you were not serious she didn’t accept you back again. There are no schools like this anyplace else. Curated: I refer to the pot as the linchpin in the relationship. It’s where your inspiration meets the collector’s inspiration. Have had people for decades that said, “we are cut from the same cloth. He’s a potter, I’m a lawyer, but we both love the north woods.” Hegland: I’ve been making pots for 40 years and mostly in the same area. A small group of collectors have a fair amount of my pots. I go back to some shows and people say, “Oh yeah, I’ve got this pot I bought from you 20 years ago. I use it all the time. I really like it.” That’s always kind of wonderful to hear. It’s also fun when people see all kinds of things in your work that you don’t consciously see. Curated: What have I not asked about that you’d like to talk about in your experience? Hegland: I’d like to talk a little bit about David Stewart, Marguerite’s longtime teaching assistant at Pond Farm. David is about 20 years older than me and has served throughout my pottery career as a role model and mentor. After Pond Farm ended in 1980, David and I stayed friends and in contact. He’s someone who has devoted his life to being a full-time creative studio potter. Through dedication and very hard work he made his living, raised a family and brought the quality of his pots to the highest level. David, who lives near San Diego, came to the Midwest several times to give seminars to share what he had learned over his career. This information and his example are very important to me. He also wrote me many letters, usually including beautiful drawings to illustrate his ideas. I treasure these letters. Dave stopped making pots some years ago to concentrate on painting. He continues to make art in his 80’s. 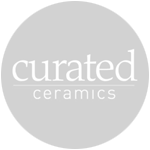 ©Curated Ceramics 2018. Text and images may not be reused without expressed permission from this website. A chemistry major in college, my life changed when I took a pottery class in 1972. I was immediately drawn to the sensuous, earthy strength and plasticity of clay. Pottery presented a combination of the practical and aesthetic that resonated with me. 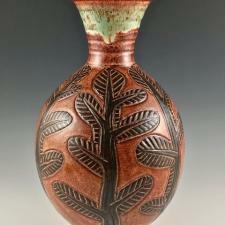 I was lucky enough to study with professional potters who were excellent teachers and role models. In my journey as a potter I have found that I am most comfortable and stimulated working alone although I also enjoy collaborations. Most of my work is on the potter’s wheel, a traditional German kick wheel for smaller pots and a electric powered wheel for larger pots. Sometimes I hand build or combine throwing and hand building. My goal is to make forms that are both functional and imaginative. I enjoy the challenge of decorating pottery forms with drawing, painting and carving. The chemist returns as I formulate my own clay bodies, colors and glazes. Art Festivals have been a way to show my work and interact with others. I have traveled widely with my pots.